Donations to the Sausalito/ViÃ±a del Mar Sister City program help support the ongoing development of lasting cultural relationships between the citizens of Sausalito and Vina. 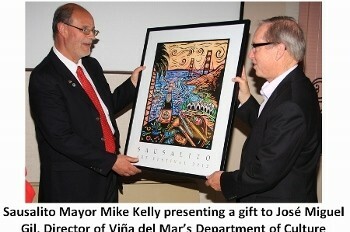 During the past year funds were used to host a one-week visit to Sausalito in October by the head of ViÃ±a del Mar's Department of Culture and a well-known ViÃ±a del Mar artist who participated in an exhibition of paintings and met with a wide range of community groups in Sausalito. In addition the pen pal program developed last year between Willow Creek Academy here in Sausalito and the Colegio Sagrada Familia in ViÃ±a del Mar, this year expanded to include all of WCA's third and fourth grade students who are part of the school's Spanish immersion program. During 2013 there will be delegation of 7 ladies visiting Sausalito from ViÃ±a for meetings to discuss "entrepreneurship" and how it might be partnered between the two cities. The Sausalito/ViÃ±a del Mar Sister City program is part of Sausalito Sister Cities, Inc. a 501(c)(3) organization and monetary donations are tax-deductible.